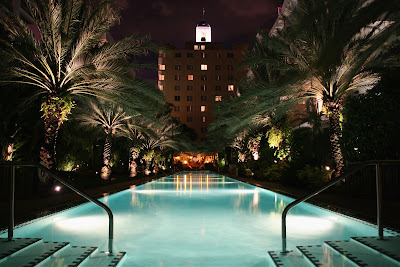 I'll be down in South Beach this weekend doing some reading and relaxing by the ocean. Posts will be limited until I return on Tuesday. Have an excellent weekend! Rumors are coming from overseas this afternoon that the Portugal bail out cost could reach $100 billion. The European bail out system makes very little sense. The bail out money comes from other countries and the IMF and only provides a temporary loan to push back default. Imagine if your friend owed a total of $300,000 in credit card debt, made $2,000 per month at his job, and had monthly expenses of $5,000. To cover the difference he borrows $3,000 every month in new credit card debt, plus he borrows the cost to pay the interest. To help him out you tell him you will lend him $100,000, but he has to pay you interest on the loan. Anyone who finished 7th grade math understands this is not an intelligent decision. However, this is the structure used to bail out Greece, Ireland, and now Portugal. These countries will never be able to pay back the orginal debt, nevermind the new "bail out" loans. Your friend above should declare bankruptcy, wipe away his current debt, and start fresh. It will take many years to rebuild his credit and his lifestyle will be severely impacted in the short term, but that is the only logical choice. The EU has this option available (restructure the debt) plus one more. The ace up the sleeve. The European Central Bank can print money and buy government bonds. This scenario is far easier in the short term because the restructuring comes in the form of lowering the value of the currency which simultaneously lowers the value of the debt. It is a hidden default that shows up at the grocery store and gas station, not in the news. The United States, which is also insolvent, has decided to pursue this option. The man in charge calls it Quantitative Easing. Investors call it rocket fuel for precious metals. There appears to be a continuous stream of black swan type events that are hitting the markets week after week. Most recently it was seen with the Japanese earthquake, today it has moved back to the EU where Portugal is on the brink of insolvency, and tomorrow we will probably move back into the Middle East. In this environment we see the FOREX currency markets around the world in turbulence as the fiat paper currencies that are backed by nothing of value continue to rise and fall against each other in chaotic fashion. In the past I have described it as a large fleet of ships sinking together into the sea. They are all falling in value together, some are just moving at a fast pace. So how do you measure something that has no value? With something that does. Gold ran through $1440 today, a new all time record high. Silver crossed $37, a new 31 year high. As the chaos continues, our leaders will continue to follow the blueprint laid out in steps 1 and 2 above. Gold and silver pull backs will be violent along the way. Stay the course and have capital ready to enter when the opportunities arrive. Knowing that a housing recovery is fully underway, because we have heard it for many months on the news, investors were excited for this week's economic data which is packed with housing numbers. 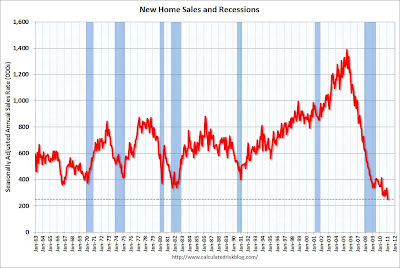 We kick things off this week with the new home sales number, and it was as expected: remarkable. In February we saw the lowest number of sales in history posting an annual rate of 250,000. The clock is ticking on many home builders to stay alive as their interest payments on empty land continue to remove oxygen every month. They continue to hope that the mania will return. I continue to believe they will be handing property directly back to the banks. We'll have to wait and see which comes first. 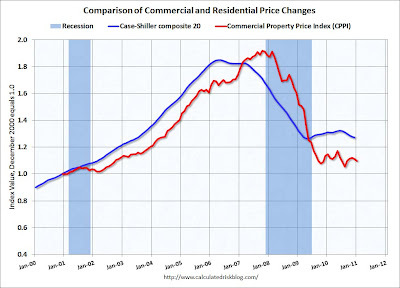 Moody's reported this morning that commercial real estate prices fell 1.2% month over month in January. 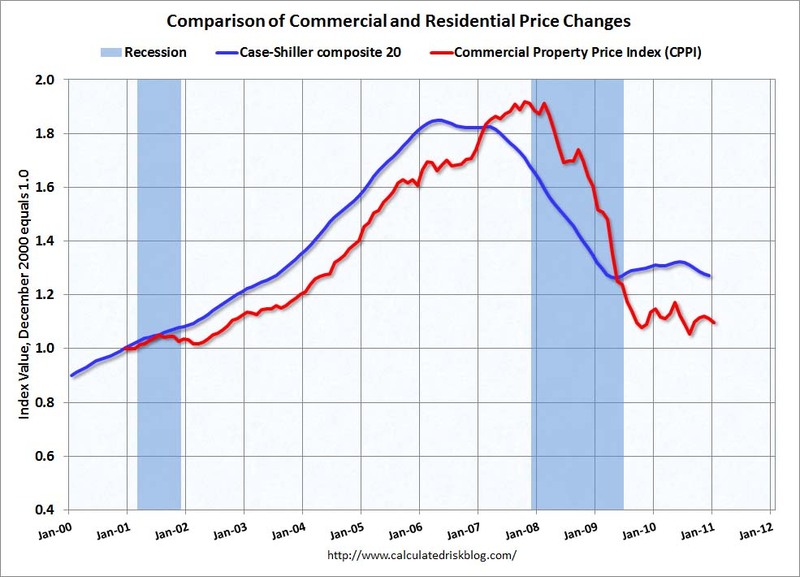 Prices are down 4.3% year over year, and down 43% from the peak of the bubble. This is the eye of the storm. Rising interest rates and shadow inventory will bring the next round of pain for prices in the future. 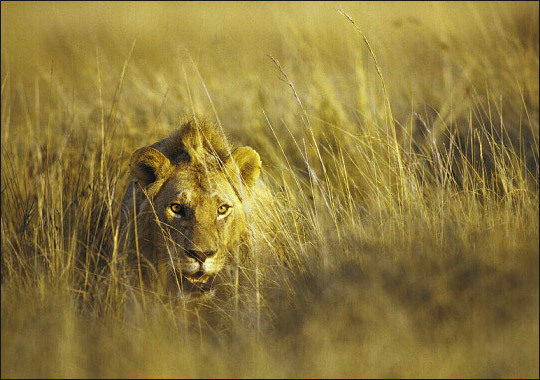 Stay liquid, focused, and wait for your prey to weaken further. Updated graph below showing the European Union member country bond yields. 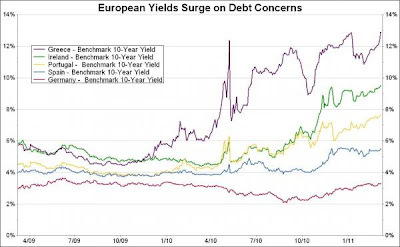 Rates (yields) rising means that bonds are losing value as investors require a higher premium to take on the risk of investing in the country's debt. As Greece and Ireland scream upward to record highs, Portugal is right behind and moving closer to their coming bail out package. The mirror image of the chart is the 1 year price of gold which is also closing in on a new all time record high. Over the past 60 years America has tranformed from the world's largest creditor nation (we produced goods and sold them to the rest of the world) to the largest debtor nation (the rest of the world produces goods and we buy them). In 2006 we bought $800 billion more in goods than we exported. To provide an example, let's say we bought $1 trillion in oil from Saudi Arabia in order to take care of our energy needs. In exchange we sent them $200 billion in military products. The difference is $800 billion, which is called a trade deficit. Saudi Arabia (or China, Japan, ect.) now have $800 billion in American dollars to spend. What did they do? In order to keep their currency artificially low, which in turn would boost their export driven economies, they turned around and invested the money right back into the United States. In 2006 our total deficit was $160 billion. That means the government needed to borrow $160 billion in order to cover expenses. They do this by issuing I.O.U. 's called treasury bonds. Foreign countries eagerly bought up these $160 billion in treasury bonds with their $800 billion in spending money. But that left them with another $640 billion to spend. So they began to buy American mortgages, corporate bonds, and stocks, which added fuel to our already growing credit bubble. This bubble burst in 2008. We now only run a $500 billion trade deficit, but our annual budget deficit is now $1.5 trillion per year. So if foreign countries decide to reinvest 100% of their spending money back into America (which they don't have to do) then we will still have an annual gap of $1 trillion. This is where the Federal Reserve steps in. The Fed has become the missing buyer to fill this gap. So what would happen if the Fed stopped buying treasury bonds in June when QE 2 is scheduled to end? Money would have to move out of stocks, corporate bonds, real estate, ect., to fill the gap needed to fund our deficit. Up until now, with the Fed purchasing the debt, investors have not had to make that choice. As I have continued to say; the Fed has painted themselves into a corner. While I continue to believe we have one more major disinflationary shock to the markets ahead of us, the final outcome will be an inflationary depression for the United States as we move toward the Greece moment when the market runs on our debt. Assets being bought today at ridiculous pie in the sky prices, such as commerical real estate, will go on sale at once in a lifetime bargains. 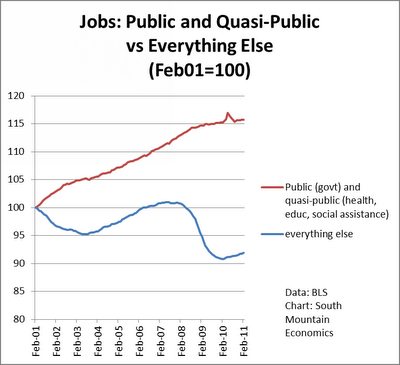 Public jobs growth (government) vs. all others (jobs that pay for government workers) over the past 10 years. This is known as a ponzi scheme and does not end well.